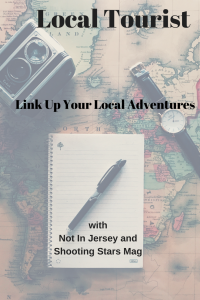 It’s time to share all the fun, local adventures you had this past month with myself and Dara from Not In Jersey. Join us every last weekday of the month for Local Tourist; you can link up your posts below. To be honest, there wasn’t a ton that I did in November that would really suit a Local Tourist post. I had a couple wedding showers to attend for one of my best friends, and I saw a couple movies (A Star is Born and the new Fantastic Beasts); I loved both of them. I also just came back from New York City, and I’ll have posts about that soon, but obviously that’s not local to me. However, I did attend a library event with my mom where we made tiles. It was supposed to be a bit of a Fall theme, but most people really just did what they wanted. I think they turned out okay…we both made two, and liked one over the other. My family might be attending a local event tonight, and if so, I’ll talk about it next month. For now though, that’s about it for November’s local adventures. I can’t see the pics for some reason but you and your mom always find fun carfting activities! I like the tiles! Especially the colors used on the B one. I went to a holiday art even at a local college last minute with my husband and we took my mom. Not many vendors but it was still nice to look around. I really enjoy hearing about the library events you attend! I hope you had a great trip! I love hearing about all the cool activities you do with your mom! Love the tiles! I love the local tourist idea. We didnt get out much this month as we should have but hopefully next month we will be better about making it a priority. Those tiles are cute! What a fun little project! The tiles are really cute! That sounds like an event I would enjoy. I can’t wait to hear more about New York! Am I remembering that you have done several great projects through your library. Yay!!! My grand made me a tile coaster at an art fair and I wish I had sprayed it with a gloss topcoat to protect it right away. Some of the art wore off on the bottoms of my cups before I realized I could something about that!! Our art museum has had some great free programs recently for making crafts. Most recently a dia de los muertos mask. Hoping they will do something fun for the holidays. Are you home from NYC??? Cute tiles. Your library is always doing fun stuff. I love that you made tiles with your mom! I’d love to do more mother daughter stuff with my mom! I love the one on the top left the most, I think! Sounds like such lovely events you have at your library! Those tiles must have been fun to make. Anthea recently posted: Hello Friday! There’s a house here that times their Christmas lights with a local radio station and we go and see it almost every year around this time. I love the tiles! I love when libraries and other public buildings showcase visitors art! Those tiles are so pretty! Your library always has the best events. Ooh, those are super cute Lauren! Did you need to use a specific tile paint? They would make great coasters! The two you weren’t so keen on, which I think are adorable, you could always try mosaic with them. You just need a little glue and instant grout to fill in the cracks. I love mosaic items, they remind me of Mediterranean summers. I’ll be checking out my library over Christmas to see if they have anything on as well!